• Incorporation of more complex climate processes, including water vapour, sea-ice dynamics and ocean heat transport. • More satisfactory simulations of current climate. • Simulations that include effects of natural and anthropogenic forcing. • Model simulations of ENSO and other extreme events have been substantially improved. • Enhanced scrutiny of models due to more global access to them, producing a diversity of evaluation perspectives and more detailed approaches, ranging from yearly to daily evaluations of forecasts. • Advances in the understanding of differences between the different models (i.e. cloud, vapour-lapse and cryospheric feedbacks). • Improvements on temporal and spatial resolutions, computational methods and parameterization. • Elimination of the use of flux adjustments, although there are some biases that remain among the different simulations. • Improved simulation of tropical cyclones. • Exploration and production of ensembles of model simulations. • Incorporation of carbon cycle simulations on some AOGCMs. • Sensitivity experiments have been improved through deeper evaluation of Earth system models of intermediate complexity. Climate models analyse Earth processes by using three-dimensional grid cells within which mass and energy fluxes and storages are quantified by a number of equations describing the behaviour of several climatic variables. The models provide numerical solutions to the Navier Stokes equations devised for simulating meso- to large-scale atmospheric and oceanic dynamics, in addition to parameterization schemes (i.e. radiative transfer, turbulent mixing, boundary layer processes, cumulus convection, precipitation and gravity wave drag) (Govindan et al., 2002). GCM simulations are carried out by means of a large set of heavy computations and thus require a considerable amount of both processing capacity and time to be able to produce a single prediction. GCMs must be calibrated using past measurements of climate variables and then fed a set of boundary conditions (such as the concentration of greenhouse gases (GHGs)) with which they simulate climate behaviour at coarse spatial resolutions. However, climate models are not perfect, mainly because the current theoretical understanding of climate is still incomplete and a range of environmental and Earth processes still remain uncertain, leading to simplification and thus likely bias in predictions. 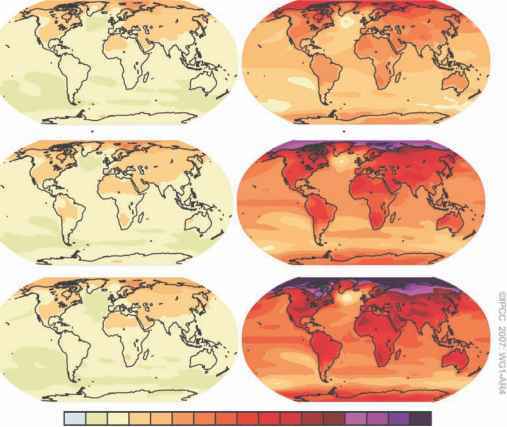 Significant improvements have been achieved since the late 1990s and comprehensive evaluations of climate models have yielded detailed conclusions on which processes might be adequately simulated and which models may simulate better the different Earth processes involved in climatic changes (Reichler et al., 2007). There are marked differences between different models, based on the selection of numerical methods employed, the spatial resolution of the simulation, and the subgrid-scale parameters (IPCC, 2001, 2007; Govindan et al., 2002; Reichler and Kim, 2008). A climate model is a very complex system in itself and the design of an evaluation system with enough complexity to provide clear conclusions on the main issues surrounding the possible model errors can be as complicated as the model. GCMs are thus generally tested at the system level by comparing only the results of selected variables with their observations. Such tests can reveal predictive accuracy problems, but the source of those problems is often hidden by the model's complexity, and, for this reason, comprehensive evaluations take into account the component level (i.e. isolating each process and testing it one at a time) (IPCC, 2007). Due to non-linearities in processes governing climate, the climate system response to perturbations depends to some extent on its basic state (Spelman and Manabe, 1984). Consequently, for models to predict future climatic conditions reliably, they must simulate the current climatic state with some as yet unknown degree of fidelity. Poor modelling skills in simulating present climate would result in the misrepresentation of certain physical or dynamical processes (Collins et al., 2006; Delworth et al., 2006; IPCC, 2007). The IPCC TAR reported that seven different GCMs were used in the development of climate change projections, while the IPCC FAR reported projections from 21 different GCMs (Table 2.1). These models have been developed by different climate research centres in different countries and have been tested to different extents (IPCC, 2007; Chou et al., 2008; Reichler and Kim, 2008; Pierce et al., 2009; Zhou and Zhang, 2009). Model performance varies according to the evaluated criteria (e.g. variable, temporal coverage, time slice, among others). As changes in precipitation and in extreme events are increasingly more complicated to simulate than temperature changes, evaluations have largely focused on evaluating rainfall trends, especially within the tropics (e.g. Timmermann et al., 1999; Neelin et al., 2006; Hu and Zhou, 2007; Chou et al., 2008; Pierce et al., 2009). The Coupled Model Inter-comparison Project (CMIP) (Program for Climate Model Diagnosis and Inter-comparison, PCMDI) was created in the mid-1990s with the aim of evaluating model outputs of a large list of GCMs. CMIP-1 (Meehl et al., 2000) was the first phase of the project and evaluated 18 GCM patterns (Reichler and Kim, 2008), CMIP-2 (Covey et al., 2003; Meehl et al., 2005a) evaluated 17 GCMs, and CMIP-3 (IPCC, 2007; PCMDI, 2007) evaluated 22 GCMs. Results of these evaluations are available through the CMIP project web page (CMIP, 2009). Evaluation of accuracy among GCMs, however, is still not representing the whole possible picture of variability and thus does not fully describe all sources of uncertainty regarding climate change projections. Significant amounts of effort continue to be levelled at GCM evaluation. Table 2.1. List of GCMs used in the Fourth Assessment Report (FAR). a Horizontal (T) resolution indicates number of cells into which the globe was divided. Vertical (L) resolution indicates the number of layers into which the atmosphere or ocean was divided. When a model is developed with different latitudinal and longitudinal resolutions, the respective cell sizes (LonxLat) in degrees are provided instead of a unique value. processes lead to changes in Earth and atmospheric processes by affecting the absorption, scattering and emission of radiation within the atmosphere and the Earth's surface (IPCC, 2007). Human activities result in emissions of four long-lasting GHGs: CO2, methane (CH4), nitrous oxide (N2O) and halocarbons. Due to current intensification and expansion of anthropogenic activities, emissions of these gases have become far larger than their respective removal processes. The effect of human activities on climate therefore directly depends on both current and future emissions (IPCC, 2000, 2001, 2007; Arnell et al., 2004). GHG concentration storylines and different politically oriented futures. In 1990, and again in 1992, the IPCC developed the IS92 family of emission scenarios (Leggett et al., 1992), which were subsequently widely used to drive climate models and determine the likely impacts of climate change. Each emission scenario corresponded to a particular set of assumptions about future population totals, economic development and LULCC. However, the scenarios were not constructed with impact assessments in mind and little attempt was made by the impact assessment community to ensure that the socio-economic and demographic 'worlds' being impacted by climate change were consistent with the 'worlds' used to construct the emissions scenarios (Arnell et al., 2004). With this in mind, by the mid-1990s, improvements in the understanding of many of the processes behind the emission of GHGs led to the development of a new set of more adequate scenarios called the 'SRES scenarios' (IPCC, 2000). In spite of the existence of scenarios, however, the possibility that any single emissions path will occur exactly as described is highly uncertain (IPCC, 2000), mainly because there is no way to assign them with single probabilities of occurrence. Four different SRES narrative storylines were developed to describe the relationships between emission driving forces and their evolution. Each storyline represents different demographic, social, economic, technological and environmental developments. For each storyline the IPCC developed, different scenarios using different modelling approaches and a total of 40 SRES scenarios, housed in four major families of scenarios, were developed (IPCC, 2000). The four families of SRES storylines represent world futures in two dimensions: a focus on economic or environmental concerns, and global or regional development patterns (IPCC, 2000; Arnell et al., 2004; Fig. 2.1). Detailed information on SRES scenarios development and modelling is available in the IPCC Special Report on Emissions Scenarios (IPCC, 2000). Fig. 2.1. SRES storylines (adapted from Arnell et al., 2004). global population. Economic development is primarily regionally oriented and per capita economic growth and technological change are more fragmented and slower than in other storylines. B1: A convergent world with the same global population as in the A1 storyline, but with rapid changes in economic structures towards a service and information economy with reductions in material intensity and the introduction of clean and resource-efficient technologies. The emphasis is on global solutions to economic, social and environmental sustainability, including improved equity, but without additional climate-harming development. B2: Emphasis on local solutions to economic, social and environmental sustainability. It is a world with continuously increasing global population at a rate lower than A2, intermediate levels of economic development, and less rapid and more diverse technological change than in the B1 and A1 storylines. While the scenario is oriented towards environmental protection and social equity, it also focuses on local- and regional-level development processes. 9.7-36.7 GtCO2-eq (25-90%) between 2000 and 2030 (Fig. 2.2). The rate of increase of emissions of CO2 are relatively constant for the two families of scenarios (A2 and B2), while other scenarios show a peak and then a decrease in CO2 emissions. Scenarios B1, A1B and A1T show their peak in 2050 with CO2 emissions up to 45, 70 and 50 GtCO2-eq, respectively, while the scenario A1FI shows a peak in 2080 with approximately 130 GtCO2-eq. Uncertainty is a significant issue arising from any climate change projection (Carter et al., 2001; Arnell et al., 2004) as everything within the context of climate change is merely a forecast. This uncertainty arises from three main sources: (i) uncertainty in forcing scenarios (see earlier section on GCMs); (ii) uncertainty in modelled responses to given forcing scenarios; and (iii) uncertainty due to missing or misrepresented physical processes by models. Fig. 2.2. Anthropogenic emissions of CO2 for the six illustrative SRES scenarios, A1B, A2, B1, B2, A1FI and A1T. For comparison the IS92a is also shown (adapted from IPCC, 2000, 2001). implementation of technological changes; (ii) the characteristics of the economic model used to project GDP; and (iii) assumptions about future exchange rates. Models, therefore, need to be calibrated to each different forcing scenario and this calibration involves further uncertainty in the analysis. Under a global commitment to cap CO2 emissions, in order to maintain temperature rises below 2°C, the degree of uncertainty regarding GHG emission scenarios would be substantially reduced. Assumptions on economic and population growth driving the generation of different scenarios are not the only source of uncertainty. Application of climate models to boundary conditions established by emission scenarios also introduces uncertainty. However, the degree of uncertainty among models and model-ensembles can be calculated so that we know both the likely future climates and the likelihood of producing a wrong estimate (Thorpe, 2005). This is because modelled responses by different GCMs produce uncertainty mainly due to the fact that each model uses a different set of equations in order to quantify the degree at which the atmospheric processes are affected by changing concentrations of GHGs. These different equations have the general characteristic of responding to increases in CO2 concentrations with increases in temperatures, but responses in precipitation and other weather variables may differ significantly from one model to another. The use of multi-model mean ensembles (IPCC, 2001, 2007) permits the reduction and quantification of uncertainty, but is still affected by performance of individual members (IPCC, 2001, 2007; Stainforth et al., 2005; Thorpe, 2005; Quiggin, 2008; Nychka et al., 2009). Selection of the best ensemble members is thus required if accurate forecasts are to be produced. Future climate projections are the result of the application of a numerical weather model, which often tends to misrepresent atmospheric processes. There are two reasons for this: first, because, a truncation error is utilized for the numerical method, and secondly, because patterns occurring at smaller scales than the grid resolution must be included (i.e. parameterization) (Thorpe, 2005; Quiggin, 2008). Structural uncertainty is introduced by scientific choices of model design and development (Nychka et al., 2009), including model parameterization, equation and choice of cell size. There are a large number of choices in constructing a complex model such as a GCM, and inevitably, these choices lead to different results (Quiggin, 2008). Current models attempt to include the dominant physical processes that govern the behaviour and the response of the climate system to specified forcing scenarios, but representing all physical processes results in a very difficult task. For that reason, models need to be calibrated by using past measurements of climates. Confidence in a model can be gained through simulations of the historical record or of palaeoclimate, but such opportunities are much more limited than those available through weather prediction. There is still a wide range of sources of uncertainty, such as the influence of various forcings on global warming (i.e. solar output changes, aerosol concentration), feedback processes that would produce additional CO2 emissions (e.g. bush fires), cost-benefit uncertainty on adaptation and mitigation measures (especially relevant in the case of developing countries), and fabricated uncertainty (politically convenient uncertainty) (Quiggin, 2008).